Astronomy Now - The Milky Way arches over La Silla Observatory | Astro What? 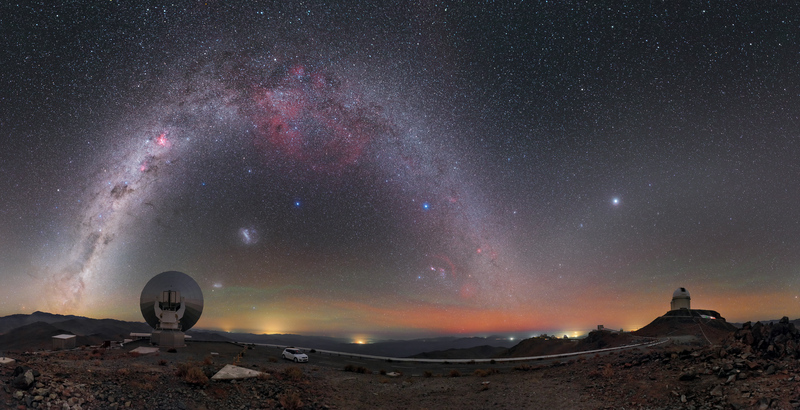 The Milky Way dazzles above the La Silla Observatory in Chile, framed by the now-deactivated Swedish-European Southern Observatory submillimetre telescope on the left and ESO’s 3.6-metre (11.8-foot) optical telescope on the right. But the Milky Way is the star of the show with the reddish Gum Nebula at the peak of the arc and the Large and Small Magellanic clouds visible just above and to the right of the dish antenna. Brilliant Jupiter shines above and to the left of the 3.6-metre telescope’s dome. European Southern Observatory Photo Ambassador Petr Horálek captured this stunning view of the Milky Way galaxy arching above ESO’s La Silla Observatory in Chile.